to guide us with their mercy, in our time of need. Words by: "Becky Hobbs" and Music by: "ALABAMA"
On September 11th, 2001, over 340 firefighters lost their lives during the terrorist attack on the World Trade Center in New York City. These men and women made the ultimate sacrifice as they went about their jobs and fought to rescue others from the inferno and chaos of this New York landmark. It's been estimated that these brave men and women may have saved the lives of more than 25,000 people in the twin towers tragedy, before they lost their own lives. Firefighters are modern day heroes. They go to work every day not knowing if they will be returning home to their families. Firefighters are killed in the line of duty every day across the country, protecting the lives and property of the citizens of this great nation. It's a duty these men and women gladly and proudly fulfill, knowing full well the risks involved. I've had the honor of working side by side with our local fire department, Fort Payne Alabama Fire and Rescue, as a volunteer for the past few years. I've seen the professionalism, dedication, determination, caring, bravery and sacrifice that these men and women have exhibited to the citizens of our area, and I'm proud to be associated with such a fine, outstanding group of individuals as these even if only in a small way. 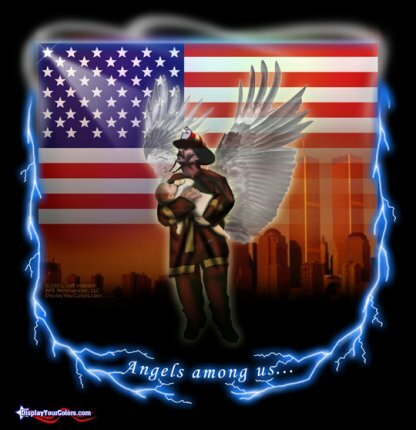 We salute and pay tribute to you, FireFighters, Angels Among Us. Photos should only be downloaded with permission from copyright owner.